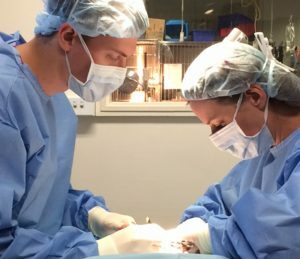 Being clinical tutors to Sydney University’s Veterinary Science students, our vets are at the forefront of the latest advances in veterinary surgery techniques. Students have an observational or assistant role in surgieres we conduct here so you can be assured that your pet is being looked after by experienced surgeons. Our surgeons frequently work with our on-site anaesthesia specialists, who will design a tailored anaesthetic and pain plan for your pet to ensure their anaesthesia is as safe and comfortable as possible. Depending on the surgery, your pet is likely to be required to stay in hospital for one or more days to recover. Our vets,vet nurses and students ensure your pet receives the best possible care. Uni Vets Camden is home to one of Sydney’s few canine blood banks and therefore able to quickly provide blood transfusions for dogs, when required.